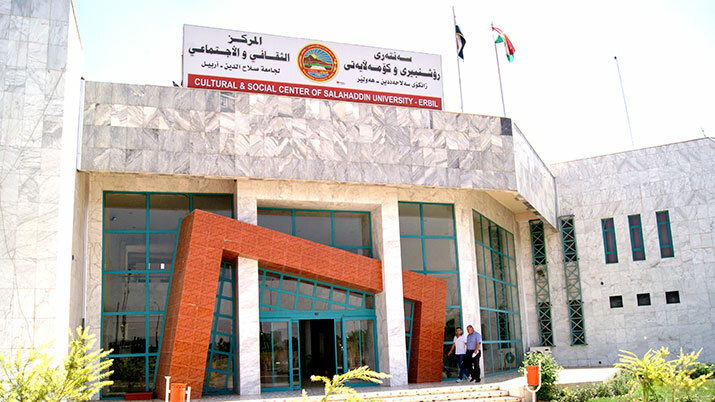 The social and cultural center of Salahaddin University–Erbil is located on the engineering campus on the Kirkuk road. It is one of those SU venues that over services to the academic circle from within and outside the university and the region. The center contains many facilities and spaces that made it to be one of the busiest convention centers in Erbil the capital. It has around lobby that can hold up to 150 people, a large 300 seats conference room , in addition to a smaller 100 seats hall, two small activities seminar rooms of 25 seats, a 25 seat computer lab, two dining areas that together can accommodate about 200 people, a fitness center with a summer swimming pool, an outdoor theater with a capacity of 200 people terrace dining room, and that’s of course in addition to parks, children's play rooms , and other management and control rooms and the kitchens. The center has facilities, equipment and technology required to hold seminars, conferences and fairs and it has been used by most of the universities educational institutions, government departments and offices as well as business, private sector and NGOs based in Erbil for its convenient pricing and location. These spaces are reserved by the Center's administration office.